We thought they could. We thought they would. They didn't. The victory that once seemed certain, eluded them that day. Our team, the Ducks, lost the BCS championship last Monday and it would be true, though sad to say, "There was no joy in Mudville" on that cold dark winter day. Some take such loss in measured stride while others turn away and it was then I learnt a lesson hard, to share with you today. Never, never, never say, "It's just a game" to a grieving sports enthusiast. Your sanity and ancestry will be questioned. Fortunately, there was food to help make things right. I know you have a score of snacks to serve with drinks on game days. I'd like you to consider just one more. 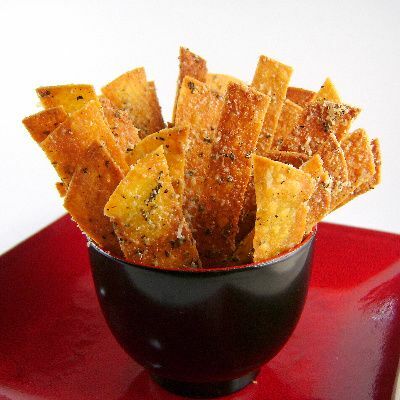 The recipe for these crisps was developed by Giada De Laurentis and you might want to give it a try. They are good, inexpensive and very easy to make. They can be made up to two days before serving in they are kept in airtight containers at room temperature. I doubt you'll have to worry about leftovers. Here's the recipe. 2) Line 2 heavy large baking sheets with aluminum foil. Whisk oil, oregano, and pepper in a small saucepan over medium heat just until warm. Set aside for 15 minutes. Brush oil mixture over both sides of tortillas. Stack tortillas and cut them into 1/2 to 3/4-inch wide strips. Arrange strips in a single layer over the baking sheets. Sprinkle cheese and salt over strips. Bake until strips are golden brown and crisp, about 12 minutes. Yield: 5 to 6 servings.